The same goes with prefixes. Many English words begin with the Greek prefix “peda”. The ancient Phoenicians were famous for their purple cloth, which they inherited from the splendid purple cloth, the finest in the entire then known world (the middle Mediterranean & the Aegean) the Minoans at Knossos had produced before them. Hence, Phoenician is a synonym for “purple”. The Mycenaean syllabary can express words beginning with “te”, but for some reason, they spelled 4 the same was the Romans did, “qetoro”, and there is nothing wrong with that. Archaic Greek sometimes expressed the number 4 with “petro” and sometimes with “tetro”. This too is not at all unusual with early alphabetic Greek, in which the various East Greek dialects derived from Mycenaean Linear B & Arcado-Cypriot Linear C flipped between these two spellings. Orthography was uncertain in archaic Greek, in other words, it had not yet fossilized into the final spelling used in Attic Greek in Classical Athens = tettares. The English word “quartet” is derived from the Latin “quattro”, which in turn was preceded historically by the Mycenaean “qetoro”, although the Latin spelling is unlikely to have derived from the latter. 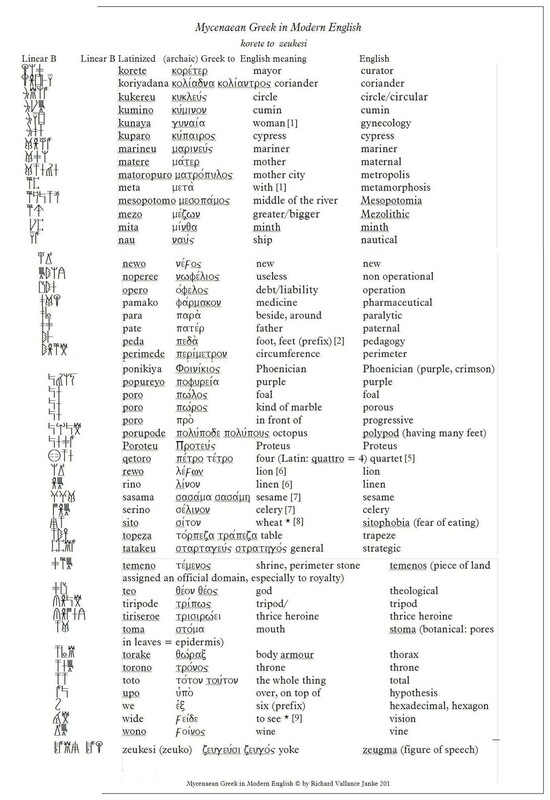 It is just that Mycenaean Greek and Latin happened to resort to the same basic spelling for 4. The ancient words “sasama” = “sesame” & Mycenaean “serino” = ancient Greek “selinon” = English “celery” are in fact not Greek words, but proto-Indo European. While “sitophobia” = “fear of eating” in English does not seem to correspond with “sitos” = “wheat” in ancient Greek, in fact it does, since wheat was one of the main staples of their diet, just as it was for the Egyptians, Romans and most other ancient civilizations. In other words, wheat was a staple food. Although the Mycenaean infinitive “weide” = archaic Greek “weidein” = English “to see”, the aorist began with “weis”, hence “vision” in English.